iHome is set to launch the new iP99 iPhone-compatible dual alarm clock radio at Brookstone specialty retail stores on June 1. According to Brookstone, the iP99 iPhone clock radio can still receive calls while docked because engineers eliminated the shielding that normally interferes with cell signals. It also has a specialized adapter to accommodate for both the iPhone and all versions of the iPod, allowing it to dock, charge and play from every one of Apple’s audio players. There are other clock radios on the market that will work with the iPod, but none of them today have allowed the iPhone to receive calls while playing music. 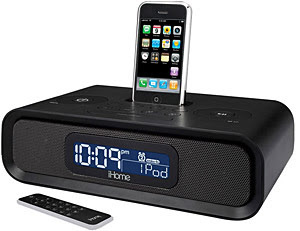 The iHome iP99 iPhone Clock Radio will go on sale on June 1 for $149.95. It features10-watt Reson8 speakers, an integrated AM/FM radio, an alarm buzzer and a remote control. Customers can already start to order the iHome iP99 iPhone clock radio through 1 june and receive free shipping, by visiting any one of Brookstone’s 314 stores in the USA or at www.brookstone.com. Brookstone, Inc. was founded in 1965 as a small New England catalog company. Brookstone, Inc., today is a USA based product developer and multi-channel retailer that generates annual sales of approximately half a billion dollars. Brookstone operates 308 branded stores, located primarily in high-end shopping malls and lifestyle centers throughout the United States and in Puerto Rico.